If you are in the need for countertop installation for your Lakeland, FL kitchen, bathrooms, garage or outdoor kitchen, give us a call for a free in-home measurement and estimate. There are a number of steps involved with countertop installation, and each one is critical to a satisfactory result. At Jim’s Floor Depot in Lakeland, FL, we take each and every step very seriously, so you are not just satisfied with the result—we want you to be thrilled! The first critical step in countertop installation is measuring and creating a template. One wrong measurement can be quite costly because it means buying another countertop. This can be particularly troublesome if you have picked out a perfect natural surface and there isn’t any material left to correct the mistake. Not only is the section that doesn’t fit unusable, but now you may have to find another slab that you like and have all the countertops redone. If we made many mistakes like that, we’d soon be out of business, so you can rest assured that we double-check, even triple-check, all measurements. The actual countertop installation includes the removal of your existing countertop. 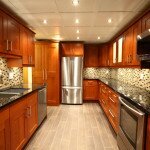 We take great care when doing this, so the existing cabinetry is not damaged. If you are replacing the cabinetry as well, but wish to save the existing cabinetry for another use, such as garage storage, we will take the same precautions. If you are reusing the countertops, we will do our best to salvage those, too. The final step of countertop installation is clean up. This entails removing all materials you are not repurposing and cleaning the area thoroughly. We leave your kitchen or bathroom looking as if we were never there, except for the fantastic new appearance of your new countertops, of course! If you are in the need for countertop installation for your kitchen, bathrooms, garage or outdoor kitchen, give us a call for a free in-home measurement and estimate.